William Lusk Coppage: Video - Amy Fleury, "Assumptions"
Video - Amy Fleury, "Assumptions"
Amy Fleury, the Director of Creative Writing at McNeese State University, was recently published in the anthology, In Their Cups, edited by A.J. Rathbun. 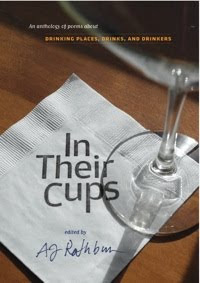 The anthology contains poems about "drinking places, drinks, and drinkers." A few of the authors of this collection were asked to send a video of them reading their poem. The videos are being featured on the PBS website. Amy asked myself and Brendan Egan to help out filming her read her poem, "Assumptions." Please click here and follow the link to view her reading as well as learn more information about this great anthology.